“Epic sea change”, “a cruise like never before”, “you’ll never want to travel any other way” ­– that’s just some of the buzz coming from Virgin HQ about their new cruise line, Virgin Voyages. Until very recently, Sir Richard Branson and his crew had been playing their cards very close to their chests about the latest venture – a tactic which set the cruising world alight with curiosity. Now, however, Virgin has revealed more details about its Voyages venture – and we think you’ll be just as excited about some of the new revelations as we are. So, to keep you in the loop on all things Virgin Voyages, we’ve scoured the web to learn all we can about the newest cruise line to take to the ocean waves, and have compiled a comprehensive list of what we know about the Virgin Voyages cruise line so far. Have the ships been named? Earlier this month (August 2018), the name of the very first ship in the Virgin Voyages fleet was announced as ‘Scarlet Lady’ – a nod to the first plane launched by Sir Richard Branson’s airline, Virgin Atlantic. During a special ceremony at the Fincantieri Shipyard in the Italian port city of Genoa – where all three of new Virgin Voyages ships are being built – Branson himself announced the name of the line’s inaugural ship, as it touched the water for the first time. The other two ships in the Virgin Voyages fleet are so far unnamed, however, the steel has been cut for the second ship, so we should expect it to be named in the coming months. What we do know for sure is that the primary fleet will all be known as Lady Ships – a play on the phrase “your ladyship”, and a cheeky nod to Virgin’s English heritage. 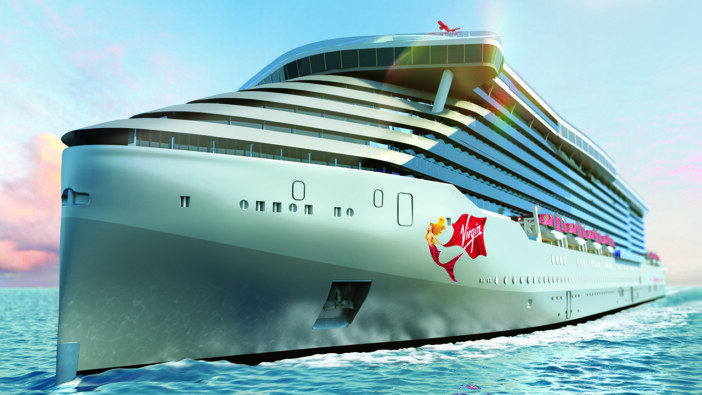 As part of the press conference announcing the name of Scarlet Lady, Virgin Voyages also confirmed that the ship will launch in 2020, with itineraries from Miami included in her inaugural season of sailing. The line also announced that the second ship in the fleet will follow shortly after Scarlet Lady in 2020 (one year earlier than originally anticipated), with the third scheduled to hit the seas in 2022. Officially classed as mid-sized cruise ships, the vessels will be 110,000 tonnes and will be capable of carrying 2,700 passengers and a crew of more than 1,500. And speaking of the Virgin Voyages crew, the cruise line announced that its recruitment drive for the ‘Scarlet Squad’ will focus on recruiting female shipboard staff, particularly in roles which currently have few personnel which are women. Speaking on the decision to actively recruit women for roles onboard the Scarlet Lady, Tom McAlpin, CEO of Virgin Voyages, told the press: “Across the maritime industry, we can do better in onboard recruiting and leadership representation for women. At present, Virgin Voyages isn’t taking bookings. However, the line did announce that it expects places onboard Scarlet Lady to go on sale in late 2018. Stay tuned to the Cruise1st UK blog and we’ll bring you the latest information and updates on the line as and when they’re announced. According to business mogul Branson, the Virgin brand aim to “breathe new life” into the cruise sector and offer a unique experience for both new and experienced cruise travellers alike. These are some of the first ‘adult by design’ ships, and will only accept passengers over the age of 18. The new line has officially waved goodbye to Broadway shows, instead choosing to focus on “cheeky and hip” adult entertainment. Perhaps the most impressive element found aboard Scarlet Lady is ‘The Crow’s Nest’, a 360° viewing tower which acts as the ship’s exclusive sundeck. Here, wellness buffs can start or end the day with a sunrise or sunset yoga session, while the space can be used for sunbathing or simply catching a glimpse of the distant horizon during the day. Elsewhere, the Athletic Club features an outdoor training zone that brings a touch of Venice Beach to the main pool area, while there’s also a series of cabanas and a sports bar for those who prefer to spend their days lounging. There’s certainly a focus on adult-wellbeing across Scarlet Lady, with several wellness zones available, including the Well-being Pool and Gym and Tonic bar, where passengers can indulge in a range of fresh, cold-pressed juices. Deck 5 also features a comprehensive spa, illustriously named ‘Redemption’, and said to be inspired by an underwater cave. According to Branson, life onboard Scarlet Lady is all about restoring guests’ ‘Vitamin Sea’, with ample opportunities for personal grooming and wellness. The ship will feature the Dry Dock Salon, Stubble & Groom barbershop and several other personal grooming venues, including a mani-pedi spa. With so many wellness areas and activities to choose from, there’ll certainly be a lot to occupy mind and body throughout a cruise on board the Scarlet Lady, and the cruise line has confirmed that all three of its new ships will have a distinct upmarket adults-only feel. “The world’s most gorgeous ships”? A sleek, silvery hull is accented by Virgin’s trademark red, and a scarlet mermaid figurehead design decorates the sides of the bow. If you’ve ever travelled on a Virgin Atlantic flight, you’ll know to expect sleek and attractive. From the prototype images we’ve seen so far, these vessels will be akin to glossy super yachts; think silver-grey colour schemes, smoked glass and creative lighting elements. Designed to be highly distinctive on the open waters, they will offer a unique level of sophistication and, according to the team, even an air of mystery. 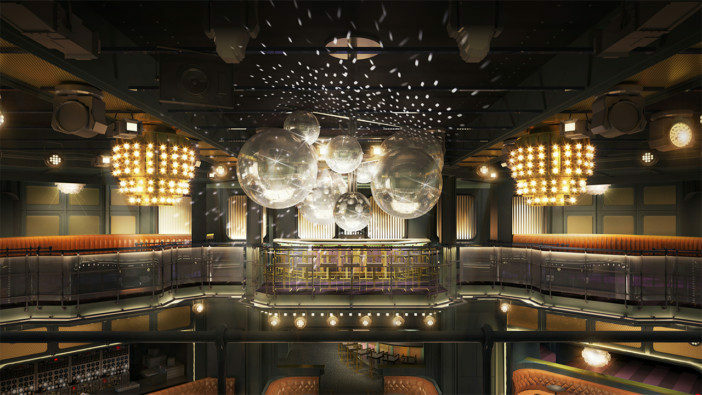 With that collective involved, you can be sure that the ship’s décor will be unlike anything you’ve seen on board a cruise ship before. Another guarantee is that 93% of the rooms on board will have ocean views (with 86% of rooms offering ‘sea terraces’) making this ship perfect for those who like their holiday photos to inspire jealousy. Word is, Branson tasked his designers and architects with creating “the world’s most gorgeous ships” – so watch this space. The Virgin Voyages vessels promise to be sustainable and eco-friendly. In the early stages of designing the ship, Virgin Voyages entered into an agreement with Swedish company, Climeon to better utilise waste heat and convert it into clean electricity and, so far, several million dollars have been spent to improve the ships’ efficiency. This ocean-friendly ethos filters down to all elements of the ships – shampoo and conditioner will be sea and sea life-friendly, sun creams on board will be reef friendly and any bottles and packaging used will be reusable (Virgin did away with plastic at their properties a long time ago). It seems they have every eco-friendly box well and truly ticked. 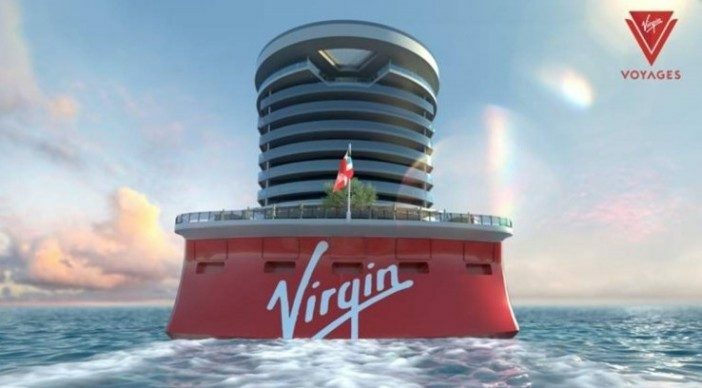 This dedication to sustainable cruising has since been confirmed by Branson himself, who touched on Virgin Voyages use of recyclable and reusable materials during the Scarlet Lady’s naming ceremony. According to Branson, all single-use plastics are banned from the new ships, including water bottles, straws, shopping bags and food packaging. Lots of the marketing material so far has related to ‘sailing the Seven Seas’, so will Virgin Voyages be launching world cruises? No, well, not straight away at least. The first year will be committed to the Atlantic, with cruises launching from its base in Miami before travelling to the glamorous Caribbean – but there is more in store. In interviews, Sir Richard has spoken wistfully about his cruise ships visiting the British Virgin Islands and also hinted that the Arctic and the Antarctic are on the company’s radar. All in all, it seems that the plan is to do a little and do it very well, but knowing the way Branson’s empires tend to grow, we’re pretty sure it won’t be long before the Virgin fleet is sailing to every corner of the globe. Keep up to date with regular updates on Virgin Voyages by signing up to the Cruise1st newsletter, and be the first to hear when bookings are being taken for Branson’s hotly-tipped fleet. Can’t wait that long? We have thousands of cruise holidays to choose from, so visit the homepage to start planning your perfect getaway today or call us on 0808 231 9871.